The Commissioning Process (Cx Process) makes sure that new or reconstructed buildings will be of the same specifications as have been agreed upon in the Contract Documents during the planning stage and in the Owner’s Project Requirements. Ideally, the criteria to be met are established and documented in the pre-planning stage in the form of the Basis of Design. They are then verified during the planning, construction, operating and utilization stages by way of extensive plausibility checks, test scenarios and performance documentation. According to that, the Cx Process is described as an “umbrella” process that bundles all issues centrally in one place during the planning stage and offers a platform for all parties involved. 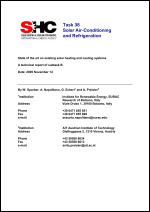 Within the subtask B of the “Task 38 - Solar Air Conditioning and Refrigeration”, an overview has been carried out on thermally driven chillers and solar thermal technologies used in realized systems. The aim of this overview is to collect information on existing solar heating and cooling systems in order to derive a first identification of proven design solutions in terms of selection of technologies and dimensioning in relationship with location, final use and size of the building. 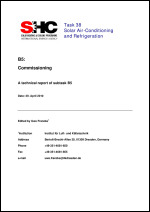 The analysis of existing design solutions can help planners in the first steps of the decision making by addressing them towards the identification of optimal design solutions for solar heating and cooling applications.